During the period from about AD 1400 to European contact, Hawaiian society underwent a transformation from descent-based (its ancestral Polynesian system) to a state-like society. The structure that came to characterize Hawaiian society - consisting of a high upper class supported by an underprivileged lower class - was somewhat suggestive of ancient Mediterranean and Asian civilizations, as well as of medieval Europe. The Hawaiian concept of the universe embodied the interrelationship of the gods, man and nature. The former, although the ultimate controlling influence in this system, granted their direct descendants - the royalty - control over the land, the sea and their resources. • Kauwa (or Kauā), social outcasts, "untouchables" — possibly lawbreakers or war captives, who were considered "unclean" or kapu. Their position was hereditary, and they were attached to "masters" in some sort of servitude status. Marriage between higher castes and the kauwa was strictly forbidden. The aliʻi attained high social rank in several ways: by heredity, by appointment to political office, by marriage or by right of conquest. The first was determined at birth, the others by the outcomes of war and political processes. Power and prestige, and thus class divisions, were defined in terms of mana. Although the gods were the full embodiment of this sacredness, the royalty possessed it to a high degree because of their close genealogical ties to those deities. 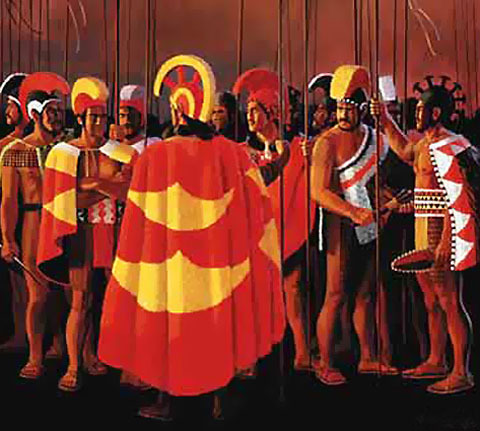 The kahuna ratified this relationship by conducting ceremonies of appeasement and dedication on behalf of the chiefs, which also provided ideological security for the commoners who believed the gods were the power behind natural forces. Commoners possessed little mana and were therefore prohibited from entering any of the sacred places where aliʻi and gods communicated, such as the heiau in which the upper class honored their gods. Outcasts, with no mana, could interact with commoners but not approach the upper class. As Handy states: "It is evident that kapu determined and regulated the three castes. For the aliʻi (and kahuna,) the kapu of sanctity was at once a wall of protection and the source of prestige and authority. The same kapu determined for the commoners their social and economic relationship to, and their reverential attitude towards their overlords. As for the kauwa, their segregation and exclusion from the social organism was due to a kapu of defilement."